One Less Gun: At about 4:10 PM on Tuesday, March 26, 2019, members of the Youth Violence Strike Force made an onsite arrest and recovered a loaded firearm in the area of Talbot Avenue and Nightingale Street in Dorchester. As part of the department’s ongoing efforts to remove illegal firearms from the neighborhoods in Boston, officers conducted a motor vehicle stop of a taxi in the area of the above location. During the traffic stop, officers recovered a Chiappa M9 .22 caliber handgun loaded with ten rounds of live ammunition on the floor behind the driver’s seat in the rear of the taxi. The rear passenger was taken into custody. Officers arrested Kerim Charles, 19-years-old, of Dorchester. Charles is expected to be arraigned in Dorchester District Court on charges of Unlawful Possession of a Firearm, Unlawful Possession of Ammunition, and Unlawful Possession of a Large Capacity Feeding Device. At about 3:50 PM on Monday March 25, 2019, members of the Youth Violence Strike Force arrested Christian Kavanaugh, 18, of Dorchester on firearm related charges in the area of Tonawanda Street and Waldeck Street in Dorchester. Officers had stopped the suspect as part of an investigation when they recovered a loaded .22 caliber American Arms Inc. PK22 handgun from the right side of the suspect’s lower pant leg during a pat frisk. The suspect was placed in custody on scene without incident. The suspect will appear in Dorchester District Court on charges of Unlawful Possession of a Firearm, Unlawful Possession of Ammunition, Carrying a Loaded Firearm and Possession of a Large Capacity Feeding Device. 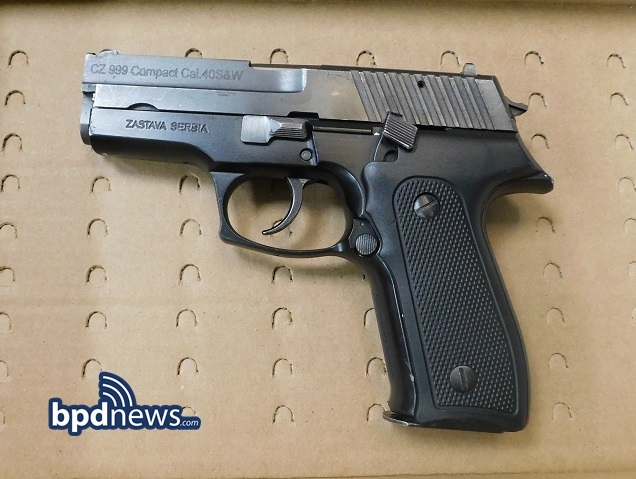 Investigation Update: Suspect in Custody After BPD Officers Recover Unattended Firearm Found in Laundry Room: At about 6:33 AM on Friday, March 22, 2019, officers from District E-13 (Jamaica Plain) responded to a call for a group of males making noise and causing a disturbance in the area of 954 Parker Street in Jamaica Plain. On arrival, officers observed three males quickly exit the laundry room and disappear into the building. In light of the hasty departure, officers conducted a protective sweep of the laundry room. While searching the room, officers observed a black jacket resting on top of one of the laundry machines. While lifting the jacket, officers immediately felt the weight of an object consistent with that of a firearm. Upon looking in the pocket of the jacket, officers were able to discover and recover a loaded black Smith & Wesson 40 Caliber Firearm. After rendering the weapon safe, officers transported the firearm to the Ballistics Unit for further processing. Investigators soon identified an 18-year-old-male from Dorchester as the suspect wanted in connection to the recovered firearm and were granted a warrant for his arrest. At about 10:35 AM on Monday March 25, 2019, members of the Youth Violence Strike Force located and arrested the suspect without incident at his residence. The suspect has since been arraigned at Roxbury District Court on charges of Unlawful Possession of a Firearm, Unlawful Possession of Ammunition, Carrying a Loaded Firearm and Possession of a Large Capacity Feeding Device. 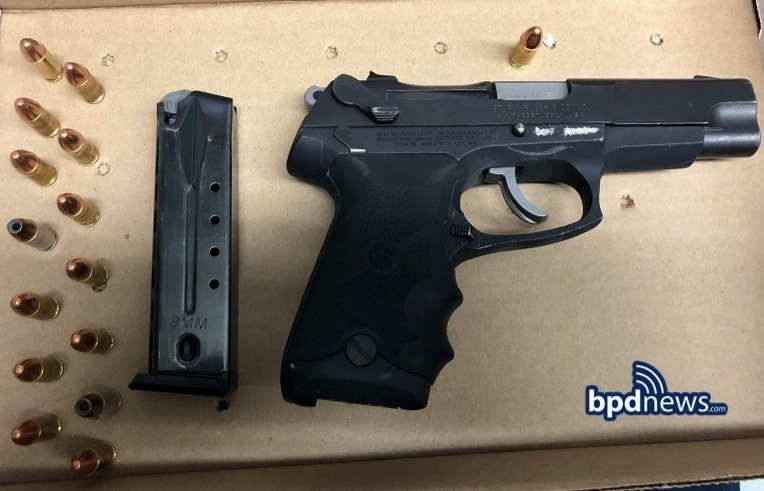 ONE LESS GUN: At about 9:07PM, on Sunday, March 24, 2019, officers assigned to the Youth Violence Strike Force responded to a radio call for a person with a gun in the area of Stonehurst and Norton Streets in Dorchester. While en route to the call, officers received information relative to the suspect’s description. Officers were told to be on the look-out for a stocky Hispanic male suspect with facial hair, 5’8” tall, stocky build wearing a backwards baseball hat and a green puffy jacket who was seen running from the scene with what appeared to be a dark-colored firearm in his hand. In short time, officers observed an individual matching the description of the suspect in the area of Stonehurst and Norton Streets. While approaching the suspect, officers observed the suspect move towards a parked motor vehicle, open the rear passenger door and place something on the floor of the car before hastily slamming the door closed. Fearing the presence of a weapon, officers ordered the suspect to show his hands before placing him into handcuffs for the safety of the officers and community members in the immediate area. While performing a pat frisk of the motor vehicle’s rear passenger area, officers discovered and recovered a large, loaded black handgun (see photo) found on the floor of the vehicle. Officers arrested a 45-year-old male from Boston and charged him with the Unlawful Possession of a Firearm, Unlawful Possession of Ammunition, Carrying a Loaded Firearm on a Public Way and Possession of a Firearm with an Obliterated Serial Number. When asked to provide a license to carry a firearm, the suspect stated that he was unable to. Safer Boston: One in Custody after BPD Officers Bravely Confiscate a Firearm in Roxbury: At about 2:08PM, on Wednesday, March 13, 2019, members of the Youth Violence Strike Force made a firearm arrest in area of Parker and Gurney Streets in Roxbury. Officers were on directed patrol in the area of Annunciation Road as a result of a shooting incident which occurred the day before inside the Annunciation Housing Development. While patrolling the area, officers observed a group of males loitering in a courtyard. Several of the individuals were known to the officers as a result of previous interactions and encounters. Upon seeing the approaching officers, the group slowly dispersed and began walking away from the area. As the group was leaving, officers observed one of the individuals get involved in a verbal altercation with a motorist. During the verbal altercation, officers observed the individual gesturing and motioning towards his waist area in such a way as if to suggest he was in possession of a firearm. Fortunately, the altercation ended without injury when the motorist drove off. However, the officer’s concern that the individual may be armed remained. In an effort to better understand their observations and concerns, officers, with badges clearly displayed, approached the individual and his three friends in the area of Parker and Gurney Streets. When instructed to remain on the sidewalk, the individual ignored the officers and quickened his pace in an effort to put distance between himself and the officers. However, after catching up to the suspect, officers conducted a pat frisk for the presence of weapons. As a result of the frisk, officers were able to feel and find a firearm in the suspect’s left pocket. When asked to produce a license to carry, the suspect stated that he didn’t have one. The loaded firearm (see photo) was determined to be a Ruger LCP .380 Auto Pistol. Officers arrested Dedric Dew, 21, of Lynn and charged him with the Unlawful Possession of a Firearm and Unlawful Possession of Ammunition. He will be arraigned in Roxbury District Court. At about 2:09 PM on Friday, February 15, 2019 members of the Youth Violence Strike Force made an onsite arrest and recovered a loaded firearm in the area of 8 Kenwood Street in Dorchester. As part of an ongoing firearm investigation, officers arrested Allan Parrish, 26-years-old, of Dorchester and recovered a Colt Detective Special Revolver loaded with six rounds of live ammunition from a jacket he had been wearing. Parrish is expected to be arraigned in Dorchester District Court on charges of Unlawful Possession of a Firearm Second and Subsequent Offense, Unlawful Possession of Ammunition Second and Subsequent Offense, and Armed Career Criminal. At about 3:00 PM on Friday, February 1, 2019, officers assigned to District B-2 (Roxbury) made an onsite arrest in the area of Centre Street and Wyman Street in Jamaica Plain. Following an extensive investigation, officers arrested Abdirahman Abdi, 25-years-old, of Brockton on an outstanding warrant out of Roxbury District Court for charges of Unlawful Possession of a Firearm, Discharging a Firearm within 500 feet of a Dwelling, Attempted Murder, Armed Assault to Rob, and Assault and Battery by means of a Dangerous Weapon. The facts of the original incident are as follows: At about 8:49 PM on Tuesday, January 29, 2019, officers assigned to District B-2 (Roxbury) responded to a radio call for a person shot in the area of Columbus Avenue and Ritchie Street in Roxbury. On arrival, officers observed an adult male victim suffering from an apparent gunshot wound. The victim was transported to a local hospital with non-life-threatening injuries. Earlier today, at about 12:00 PM on Thursday January 31, 2019, members of the Youth Violence Strike Force located and arrested Donnelle Joyner, 23, of Mattapan, on firearm related charges in the area of 3 Pemberton Square in Boston. At the time of his arrest, the suspect was wanted on an outstanding warrant sought out of Roxbury District Court stemming from an investigation following a traffic stop earlier in the week. At about 7:13 PM on Monday January 28, 2019, officers assigned to District B-2 (Roxbury) had stopped a vehicle for a traffic infraction on Blue Hill Avenue when the suspect, who was a passenger in the rear seat at the time of the stop, fled the area. The officers continued their investigation and later recovered a loaded .380 Astra A-60 handgun from inside the vehicle where the suspect had been seated. The suspect will appear in Roxbury District Court on charges of Unlawful Possession of a Firearm, Unlawful Possession of Ammunition, Carrying a Loaded Firearm, Possession of a Large Capacity Feeding Device and Armed Career Criminal (Level 3). At about 7:33 PM on Wednesday January 16, 2019, officers assigned to the Youth Violence Strike Force made an onsite firearm arrest after performing a traffic stop in the area of 476 Blue Hill Avenue in Dorchester. The officers had stopped a vehicle for a marked lane violation and were approaching to speak with the operator when the rear seat passenger, Davell Woodrum, 25, of Dorchester, who was known to the officers through previous interactions, took off running while pinning his right arm against the side of his body. Officers were able to catch up to the fleeing suspect a short distance away at which time they recovered a loaded 9mm Taurus 24/7 G2C handgun from inside the right pocket of a pair of basketball shorts the suspect was wearing beneath his pants. The suspect was then placed in custody without further incident. The suspect will appear in Dorchester District Court on charges of Unlawful Possession of a Firearm (2nd and Subsequent), Unlawful Possession of Ammunition, Carrying a Loaded Firearm, Possession of a Large Capacity Feeding Device and Armed Career Criminal Level 2. At about 7:55 PM on Tuesday, January 15, 2019, officers assigned to the Youth Violence Strike Force made an onsite firearm arrest during a traffic stop in the area of Geneva Avenue and Olney Street in Dorchester. Officers had stopped a motor vehicle for an illegal U-turn when they learned that the operator, Maurice Watkins-Cundiff, 26, of Brockton, did not possess a driver’s license. Officers removed the operator and placed him in custody without incident at which time they asked the remaining occupants to exit the vehicle. As the front seat passenger got out, he informed the officers that he was in possession of a firearm. Officers quickly secured the passenger, later identified as Jovani Miranda, 27, of Dorchester, at which time they recovered a loaded .357 Rossi revolver with an obliterated serial number from the inside pocket of the suspect’s coat. The suspect was then placed in custody without further incident. Both suspects will appear in Dorchester District Court for arraignment. Miranda will be charged with Unlawful Possession of a Firearm, Unlawful Possession of Ammunition and Possession of a Firearm with an Obliterated Serial Number. Watkins-Cundiff will be charged with Unlicensed Operation of a Motor Vehicle. ONE LESS GUN: At about 6:47 PM on Wednesday, January 9. 2019, members of the Youth Violence Strike Force, arrested one male and recovered a loaded firearm in the area of 49 Mather Street in Dorchester. While on patrol in the area of the above location, officers observed a gray motor vehicle abruptly stop before accelerating at increasing speeds. A query of the motor vehicle led to the discovery of an expired registration. Officers attempted to conduct a traffic stop in the area of 750 Washington Street in Dorchester. Upon activating their emergency equipment (lights and sirens) the suspect motor vehicle fled in an attempt to evade officers. Officers pursued the motor vehicle in an initially unsuccessful attempt to stop the car. The vehicle began to slow down in the area of 49 Mather Street in Dorchester, before again taking off at a high rate of speed. Eventually officers were able to locate the motor vehicle stopped in the area of Allston Street and Mather Street. Officers approached the vehicle which was still running with the driver’s side open and the driver’s side window down. Inside of the vehicle, officers observed two young males who were unaccompanied. Officers notified the children’s mother who responded to the scene. Officers observed a male exit from a pathway next to 49 Mather Street who was breathing heavily and sweating profusely. Officers identified the male as the operator of the motor vehicle. Officers retraced the route in which the suspect had travelled and recovered a silver revolver loaded with five rounds of ammunition. Officers arrested Denzil Pierre, 35-years-old, of Dorchester and charged him with Unlawful Possession of a Firearm, Unlawful Possession of a Firearm 3rd Offense, Armed Career Criminal Level 3, Unlawful Possession of Ammunition, Unlawful Possession of a Firearm with an Obliterated Serial Number, Reckless Endangerment of a Child, Negligent Operation of a Motor Vehicle, Failure to Stop for a Police Officer, and Operating a Motor Vehicle with a Suspended Registration. Pierre was also wanted for Failure to Stop and Operating a Motor Vehicle with a Suspended License out of Brookline District Court. Pierre is expected to be arraigned in Dorchester District Court. ONE LESS GUN: At about 7:39 PM on Wednesday January 9, 2019, officers assigned to the Youth Violence Strike Force arrested Adrian Ferguson, 29, of Dorchester on numerous charges during an incident that originated in the area of 5 Salisbury Park in Dorchester. The officers were conducting a drug investigation when they approached a stopped motor vehicle which had backed into a parking area on the street to speak with the operator. Upon seeing the officers, the driver suddenly accelerated towards them, striking one of the officers as he attempted to get out of the way of the vehicle, causing the rear passenger window on the driver’s side to shatter. The officer was not seriously injured as a result of the collision and immediately began chasing after the fleeing vehicle. The suspect vehicle then struck a police cruiser that had been positioned at Park Street to block the potential path of flight. At this time, the suspect exited the vehicle, leaving it running and in gear, and began to flee on foot with a firearm in his right hand. Officers pursued the suspect, finally stopping him in the area of Dorchester Avenue and Lincoln Street at which time a violent struggle ensued. Once the suspect was safely in custody, officers were able to locate and recover a loaded.380 caliber Ruger handgun with a laser sight which the suspect had discarded in the area of 286 Adams Street. Officers continued their investigation which led to the recovery of one small plastic bag and two large plastic bags of cocaine with a combined weight of about 30 grams along with other evidence from the front passenger seat of the suspect motor vehicle. The suspect will appear in Dorchester District Court on numerous charges including Unlawful Possession of a Firearm (2nd and Subsequent), Unlawful Possession of Ammunition, Carrying a Loaded Firearm, Assault and Battery by Means of a Dangerous Weapon and Trafficking Class B Drugs. ONE LESS GUN: At about 7:15 PM on Wednesday January 9, 2019, officers assigned to the Youth Violence Strike Force made an onsite firearm arrest during an investigation in the area of Columbia Road and Geneva Avenue in Dorchester. As the officers approached to speak with a group of males, one of the individuals, later identified as Davonne Manor, 24, of Roxbury, suddenly took of running while clutching at the right side of the waistband of his pants. Officers pursued the suspect and placed him in custody after a brief struggle at which time they were able to safely recover a 9mm Glock 19 with an extended magazine loaded with 31 rounds of ammunition. The suspect will appear in Dorchester District Court on charges of Unlawful Possession of a Firearm, Unlawful Possession of Ammunition, Carrying a Loaded Firearm and Possession of a Large Capacity Feeding Device and Resisting Arrest. At about 1:00 PM on Tuesday January 1, 2019, members of the Youth Violence Strike Force made an onsite firearm arrest while recovering two loaded firearms during an investigation in the area of Woodruff Way and Woodbole Avenue in Mattapan. The officers were on patrol when they observed Josiah Stirling, 29, of West Roxbury and Naquan Mahone, 23, of Mattapan who were known to them through previous interactions walking in the area. Upon seeing the officers approaching, Stirling came to an abrupt stop as Mahone immediately took off running while pinning his arm against the right side of his waist. As the officers pursued, they observed Mahone discard a firearm on the ground which was safely recovered and later determined to be a loaded 9mm Smith and Wesson M&P Shield handgun equipped with a TR4 laser sight attached. The suspect continued to flee through neighboring backyards while scaling several fences. Despite their best efforts, the suspect was able to allude the officers. As the foot pursuit was unfolding, officers attempted to perform a pat frisk of Stirling at which time a violent struggle ensued. As the officers struggled to gain control of the suspect, a holstered firearm fell from the waist band area of the suspect. Officers were eventually able to place the suspect in custody at which time they safely recovered the holstered firearm which was determined to be a loaded .45 caliber Rock Island Armory M1911 A1-FS handgun with a defaced serial number. Josiah Stirling is charged with Unlawful Possession of a Firearm (2nd and Subsequent), Unlawful Possession of Ammunition, Carrying a Loaded Firearm and Possession of a Firearm with an Obliterated Serial Number. Officers continued their investigation which led to the issuance of an arrest warrant for Mahone on charges of Unlawful Possession of a Firearm (2nd and Subsequent), Unlawful Possession of Ammunition and Carrying a Loaded Firearm. At about 5:30 PM on Wednesday January 2, 2019, officers located and arrested the suspect in the area of 15 Ridgeview Avenue in Mattapan.